Quick updates to make sure that you’re up to speed on where some players are at. After the game, manager Ron Roenicke suggested that the team veteran might not make his next start and would almost certainly have to push his bullpen session back a day at the very least. Gallardo tried to argue his way into staying in the game but Roenicke (and the team’s head Athletic Trainer Dan Wright) made the correct call to get Gallardo out of the game right away. After all, as Roenicke pointed out during postgame, you don’t want a cascade injury to his arm because he’s altering his mechanics to compensate for the pain. 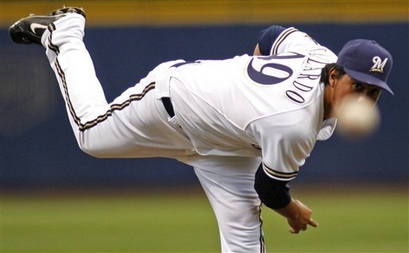 X-rays were negative for a fracture though, so even if Gallardo misses one start, it could be a circumstance where the Brewers avoid having to place him on the Disabled List. It was reported (and later officially announced) that relief pitcher Jim Henderson would begin a rehab assignment with the Class-AA Huntsville Stars. The Brewers expect Henderson to make at least three appearances in the minor leagues before determining whether he’s ready to be activated. Henderson was originally placed on the 15-day DL with inflammation in his pitching shoulder. In his last appearance (May 1 at Cincinnati), Henderson had a noticable lack of control and a telltale drop in velocity. That led to his getting knocked around badly (0.2 IP, 4 H, 1 BB, 5 ER, 1 HR) resulting in a season ERA spike from 3.38 to 7.15. He was disabled quickly after the game and it was revealed early on that they wouldn’t rush the big right-hander back before he was 100% healthy. The reason that Henderson is beginning his rehab assignment with Huntsville is because Tom Gorzelanny will be continuing his with the Class-AAA Nashville Sounds and GM Doug Melvin didn’t want them on the same roster. That’s likely to ensure that they both get into the games that they need. In two appearances with the Class-A Advanced Brevard County Manatees, Gorzelanny totaled 4.0 innings pitched while allowing two hits and a walk. He struck out one of the 14 batters he faced. The numbers really don’t mean a ton either way because he’s still simply ramping up like he’s pitching in spring training, but good numbers are certainly better than poor ones. That he was able to pitching two innings in each outing is also an encouraging sign for Gorzelanny as he is rehabbing from off-season shoulder surgery. Gorzelanny’s rehab assignment began May 14 and at the time we were told that the Brewers expected it to last the maximum 30 days. That puts Gorzelanny on schedule to possibly to return to the 25-man roster in time for a weekend series against the Reds in mid-June at Miller Park. When Aramis Ramirez (15-Day DL, hamstring strain) first was injured, he said he heard a pop and there was talk that this could be quite a bit longer than the minimum 15 day stay on the disabled list. Then while in Chicago for a chilly weekend series with the Cubs, the Brewers began saying that Ramirez, who had never had a hamstring injury to that point in his career, was pain-free walking and would likely attempt light running once the team got to Atlanta and were in warmer temperatures. I haven’t seen any reports on whether he did or how it went if he did, but it still seems that returning on Memorial Day against the Baltimore Orioles is unlikely to occur. But stranger things have happened. Just a quick item to get those up to speed who might not have been made aware of the happenings over the past couple of days. Ryan Braun was placed on the 15-day disabled list Saturday morning. The transaction is retroactive to Sunday, April 27th. That means Braun isn’t eligible to return until Monday, May 12th (an off day for the Brewers). He’ll miss the rest of this series against the Cincinnati Reds and both full series against the lowly Arizona Diamondbacks and the New York Yankees. Hopefully Braun is ready to go on Tuesday, May 13th against the Pittsburgh Pirates, but having been given no real report on his progress in returning from a strained right oblique, we’re left to wonder and hope. Taking my heading from his choice of walk-up music during home games, Logan Schafer was activated from the disabled list when Braun was placed on it Saturday. Schafer played a handful of games on a rehab assignment, some for Class-A Advanced Brevard County and then for Class-AAA Nashville before returning. He only slashed .133/.222/.200 in 26 combined at-bats, but the Brewers will appreciate getting his steady defense back on the field and his left-handed bat back in the lineup to spell Khris Davis. Davis is struggling pretty hard against right-handed pitching so far this season. Schafer was originally placed on the DL after straining his hamstring while stretching in the on-deck circle before a pinch-hit appearance on April 17th. 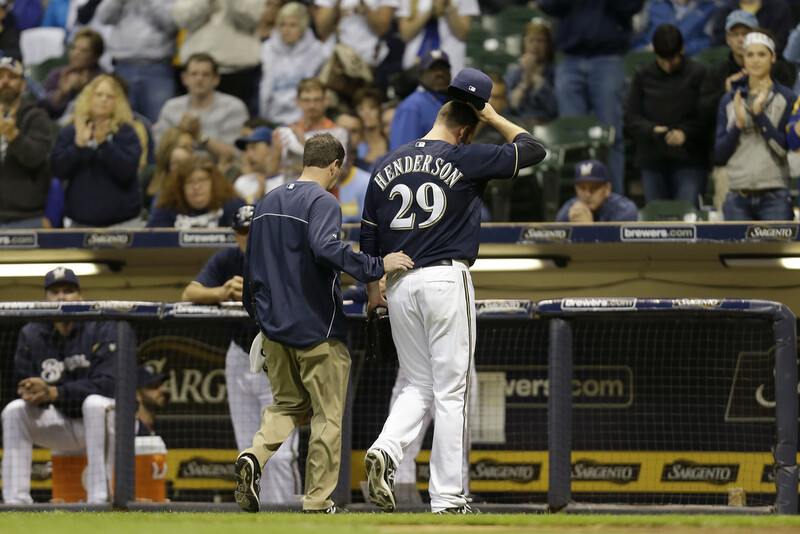 Jim Henderson, who hasn’t pitched in a save situation all season for the Brewers after velocity and command issues plagued him all spring, was placed on the 15-day disabled list following Thursday night’s game against the Reds. Henderson was diagnosed with right shoulder inflammation, which would help explain his reduced velocity in his appearance earlier that night. The Brewers wanted to get a fresh arm up from the minors anyway — then ended up recalling Rob Wooten — so the timing ended up convenient to that end. Unfortunately it was quite the inconvenience to the outcome of the game as Henderson entered in a tied game and was eventually charged with five earned runs in a rare bullpen blow up. Once Henderson is actually ready for a rehab assignment, expect the team to take its time in activating him. Given this opportunity, they’ll certainly want to make sure Henderson is finally healthy before rejoining the team. 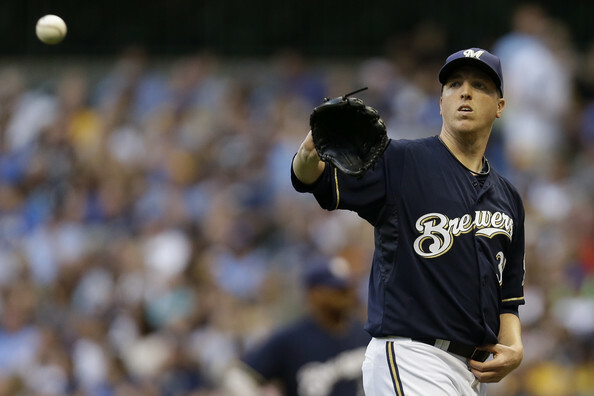 Tom Gorzelanny, who pitched very well when used out of manager Ron Roenicke‘s bullpen last year, required off-season shoulder surgery and is still working his way back. Gorzelanny still has not begun a minor league rehab assignment after suffering what was called “a little setback” during the second week of April. Then expected to miss the balance of April, we’re now in May so the question is coming back around as to how Gorzelanny is progressing. With no rehab assignment announced, they’re still looking at a minimum of a couple of weeks. Here is a listing of the MLB salaries of the 26* men earning MLB-level pay from the Milwaukee Brewers as of Opening Day. Here is the breakdown of the Opening Day 25-man roster. 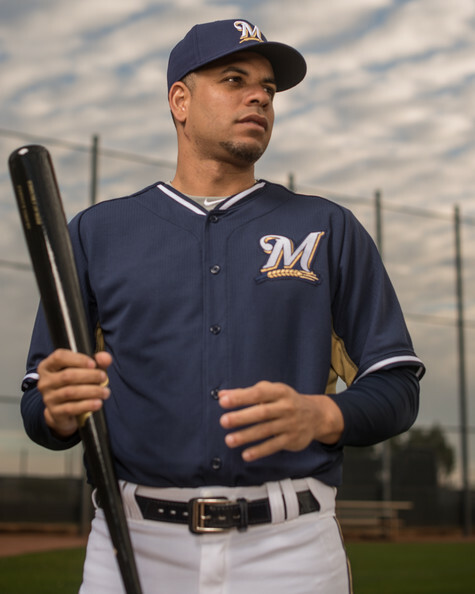 FINALLY…”Brewers By the (Jersey) Numbers” has come back! When last we joined our heroes, they were standing over the discarded #60 jersey of Wily Peralta, wondering how he had come to this new #38 he now wore on his back. That was nearly a week ago. Seriously, though, as we countdown to Opening Day by way of the numbers players will be wearing in camp and in Cactus League games, we just got through a very long drought. That’s because I don’t profile coaches and lots of coaches sport numbers in the 30s. 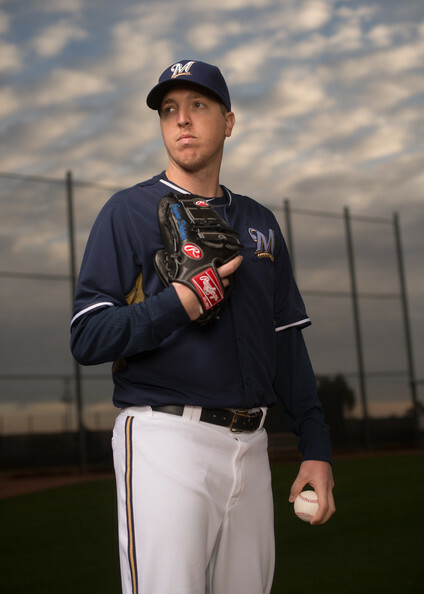 Thomas Stephen Gorzelanny is a 31-year-old left-handed pitcher. He is an Illinois native, was drafted by the Pittsburgh Pirates in 2003, debuted in the majors in 2005, and has pitched for four franchises in his career. That’s the short version. For the long version of Tom Gorzelanny’s career arc that landed him in Milwaukee prior to the 2013 season, check out last year’s profile. As for 2013, Gorzelanny ended up in more of a swing shift than he did in 2012 (one of the best seasons of his career). Some of that was rought out of necessity, but after some limited success in that necessity, the Brewers decided to force the issue and see if Gorzelanny’s successes in the bullpen over the previous year-plus could lead him back into a rotation full-time. Well, let’s just say that if nothing else, it confirmed that Gorzelanny’s future is the bullpen. He’s effective against hitters of both handedness, so he needn’t be a LOOGy (at least not yet) and can pitch multiple innings in need be, but it’s the second and especially third time through a batting order where he just got trounced. Obviously limiting his exposure by capping him to an inning or two helps to maintain his effectiveness. In fact, I wrote about getting Gorzelanny back into the bullpen last year while they were struggling through some of his starts. I laid out some arguments, left others on the table because I had made my point, but I failed to mention one key thing that ended up costing Gorzelanny the balance of his season. That being, the injury risk of sending a long-term bullpen pitcher into the rotation for a long run of starting games. I wrote that article on August 26th. Gorzelanny started again on August 28th and pitched poorly. They tried to put him back in the bullpen finally in September, but the up and down of bullpen-to-rotation-to-bullpen work had finally caught up to him and he was pulled from his first appearance back in the ‘pen. Gorzelanny was shut down following three weeks of inactivity before attempting a throwing session. Nobody likes to enter an off-season injured, but Gorzelanny would have taken it if that’s all it was. Instead, Gorzelanny had shoulder surgery in December and his Opening Day was in serious doubt. He had a little bit of a quicker rehab than expected and threw his first bullpen session on Friday, February 21st. He appears back on track for Opening Day at this point. He’s got a job in this bullpen if he’s healthy, though if he isn’t it gives GM Doug Melvin a little bit of flexibility when he’s trying to make the decisions to get down to a 25-man roster. Make no mistake though, Ron Roenicke would much rather have him available on March 31st.